Kuala Lumpur, Malaysia -- CONTRARY to what many may believe, not all the characters in Buddhism look mild and affable. Many of them, especially those of Tibetan origin, have a frightening persona with piercing eyes, sharp teeth and even red skin. 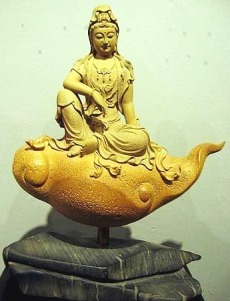 <<Divine: A wood carving of the Goddess of Mercy seated on a cloud, by Taiwan artist Shao Fa. Such images are among more than 100 Buddhist statues that are on display at Shian's Art Gallery in conjunction with the Wesak Day celebrations. “In Buddhism, particularly Tibetan Buddhism, many gods and goddesses assume more intimidating forms in order to help different sentient beings, such as ghosts and evil spirits, avoid suffering the worldly pains,” explained curator Khor Seang Cheng. “These images are not widely accepted among the Chinese, who are more familiar with the affable-looking Buddhas and deities of Mahayana Buddhism, which was propagated in China. “However, interest in statues of Tibetan Buddhism has increased in recent years, in the wake of a larger number of people embracing this branch of the religion,” he added. Khor said the gallery was always on the lookout for Buddhist statues of high artistic value, especially in the works' meticulous workmanship, intriguing design and in-depth interpretation of the teachings. “Statues are placed on the altars to help Buddhists concentrate when performing their prayers. Buddhists behold the statues every day, so we hope they can at the same time admire an artwork,” he said. The Buddhist statues on exhibition are sculpted from different materials, including wood, stone, jade and, most recently, fibreglass. Most of the works were created by artists from Fujian province in China. Fibreglass artworks are made with a mould and therefore are more affordably priced, but even so, the works can still be of high quality and good craftsmanship. All the sculptures are made to awe the beholder – the lifelike expressions are enhanced by fluid robes and intricate headgear, the postures are portrayed with fine details; for instance, the Goddess of Mercy with a thousand hands has lines on the palms, and fingers holding various tools and halos with webs of floral motifs. The Wesak Day Art of Buddhism Exhibition runs until May 20. Shian's Art Gallery is located at Lot 3-056, 3rd Floor, Endah Parade, No. 1, Jalan 1/149E, Bandar Baru Sri Petaling, Kuala Lumpur. It can be reached at 03-9543 4669 or www.shiansart.com.